Beyond providing data for all 32 NFL teams, PFF also supports network broadcasters with game-preview packets that are used to enhance the in-game experience for fans and viewers. This Cowboys-Seahawks preview features the same information our broadcast partners use for team research and in-game production. Dak Prescott has attempted just five pass attempts at least 20 yards downfield this season, for a rate of 9.3 percent, ranking 25th among 32 quarterbacks so far this season. 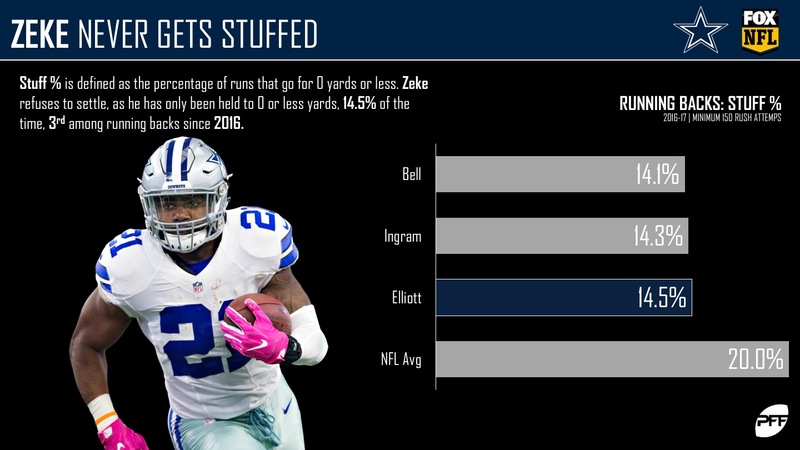 Since the start of the 2016 season, only two running backs have avoided being stuffed at the line of scrimmage more than Ezekiel Elliott. He ranks third among league running backs in terms of fewest percentage of his carries resulting in a stuff (runs held to zero or negative yards). 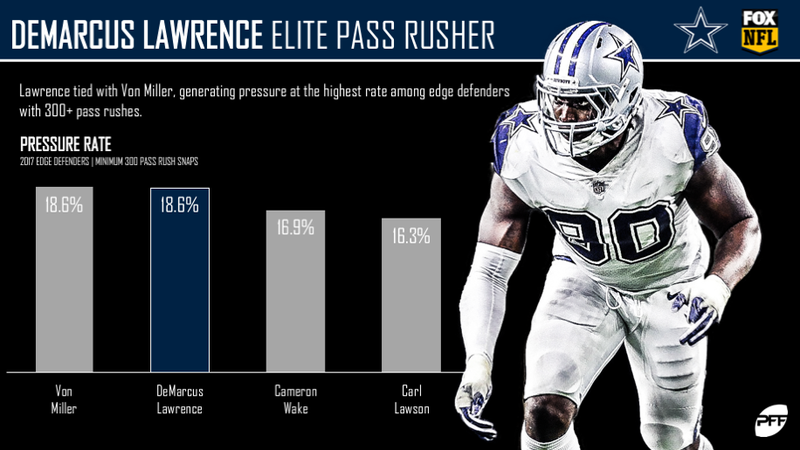 This week, Demarcus Lawrence gets a great matchup against Germain Ifedi who is currently PFF’s third-lowest graded tackle in the NFL. Ifedi has already allowed three sacks through two games (most in the NFL by a tackle), so look for Lawrence’s pass-rushing success to continue on Sunday. 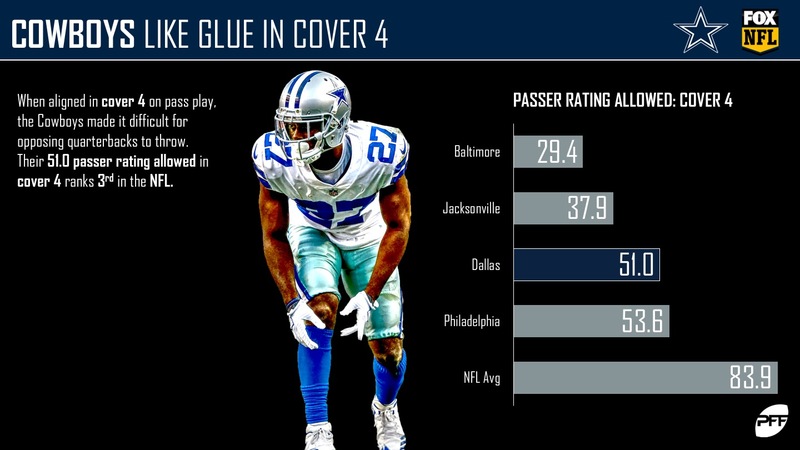 When aligned in a Cover-4 defense, the Cowboys are among the league’s best so far. Their 51.0 passer rating allowed in Cover-4 is the third-best mark in the league and a whole 32.9 points below the league average. This year, through two games, Russell Wilson has moved off his spot in the pocket on 29.4 percent of his dropbacks, the fifth most in the NFL. 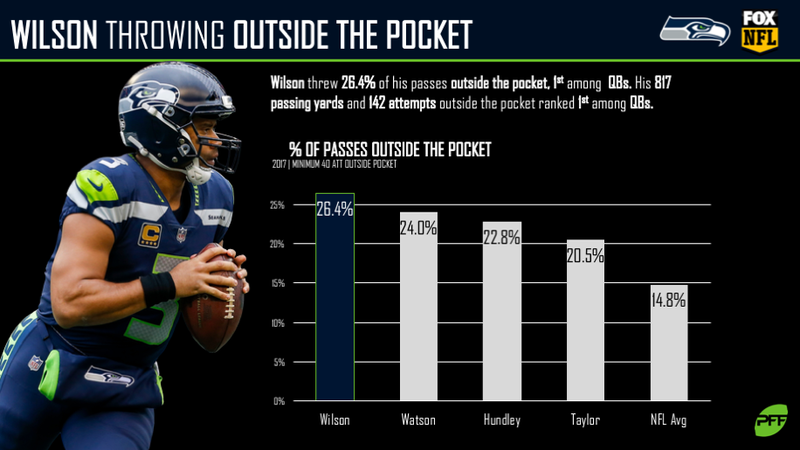 It hasn’t always been the pressure that has forced him to move, however, as Wilson has nine dropbacks this season where he has moved off his spot without any pressure – second-most in the NFL. 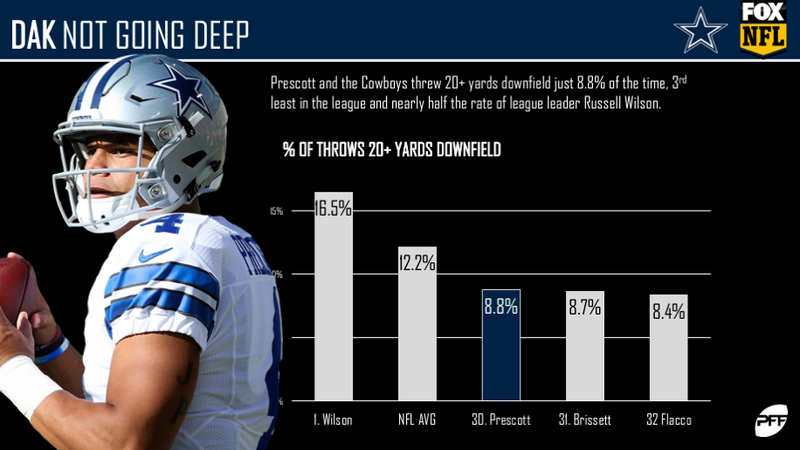 This week, Wilson squares off against a Cowboys team that has forced pressure on 32.9 percent of opposing dropbacks. Doug Baldwin gets his fair share of targets in the Seahawks offense, seeing a target on 22.0 percent of Russell Wilson’s passes a season ago. 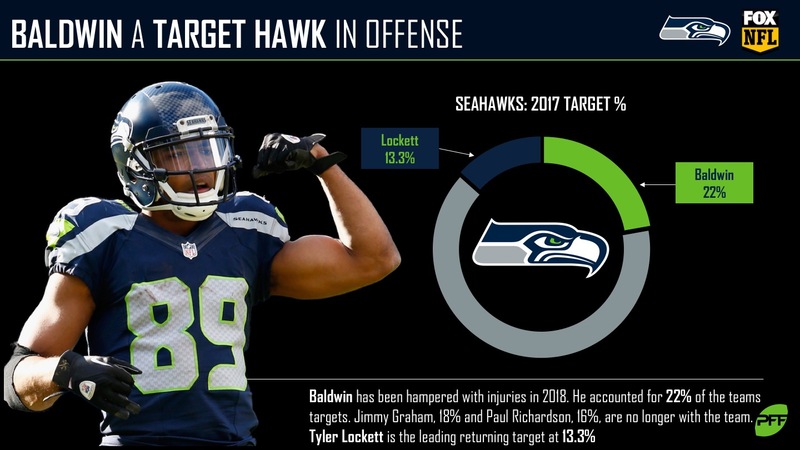 While he’s been hampered by injuries, the leading returning receiver in terms of target share is Tyler Lockett at 13.3 percent of Wilson’s passes in 2017. 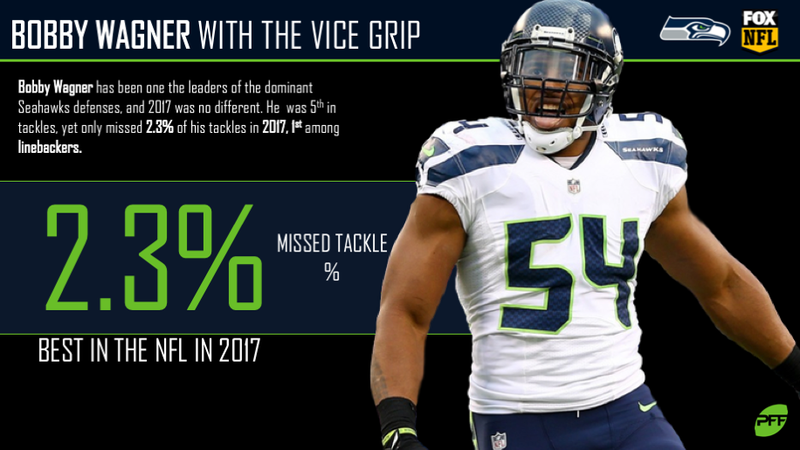 It’s been more of the same from Bobby Wagner in the tackling department to open 2018 as he has yet to miss a single tackle in two weeks. Against the Cowboys, he’ll face a tough test in Ezekiel Elliott, who has forced six tackles so far this season, the fourth-most of any running back. 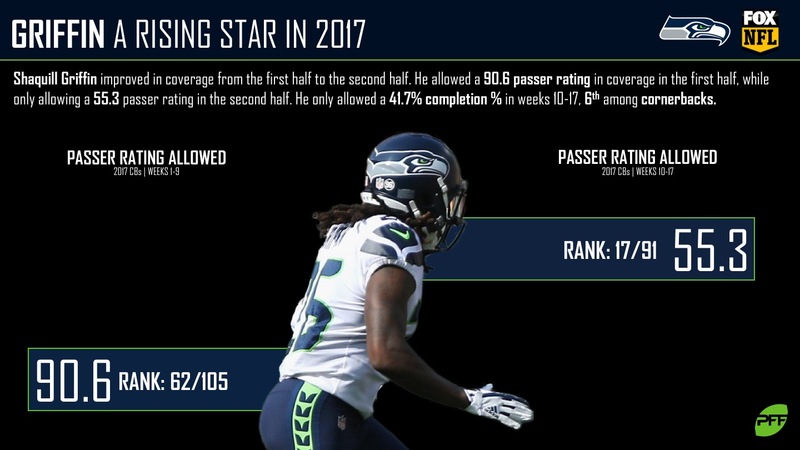 After starting the 2017 season off rather slow, Shaquill Griffin picked it up on the tail end of last season. After a two-interception game against Chicago on Monday Night Football, Griffin is looking every bit of a starting NFL cornerback. PFF Greenline has projections for the spread, money line and over/under of the Dallas Cowboys’ matchup with the Seattle Seahawks. Get their picks here.